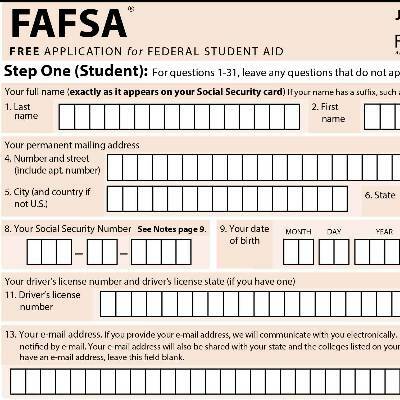 ST. LOUIS – FAFSA Free Application for Federal Student Aid – may be one of the most daunting tasks that parents and students have to tackle as part of the college application and payment process. For some, the form can be as confusing and frustrating as filling out tax forms. But parents and their students go through the process annually because the FAFSA is used by colleges and government agencies to determine if a student qualifies for grants, scholarships, and loans. In essence, completing the FAFSA assists families in identifying resources to pay for college. To help make the FAFSA easier, Webster University is participating with the FAFSA Frenzy, a state-wide coordinated effort by Missouri Department of Higher Education (MDHE) to offer workshops assisting parents and future college students on how to fill out the FAFSA. Webster’s event will be from 2 to 4 p.m. Feb. 28 on its home campus in Webster Groves. The University also will be participating in similar events in the St. Louis region on Feb. 6 and Feb. 20. In Missouri, students studying in the state in 2013-2014 received nearly $2.3 billion in federal financial aid and an additional $1.5 billion in aid from state and other sources, the Missouri Department of Higher Education calculated. Webster University is one of several institutions partnering with the Missouri Department of Higher Education and the Missouri Association of Student Financial Aid Personnel to bring FAFSA Frenzy to Missouri in 2016. Times, dates and locations for all FAFSA Frenzy events are available at http://dhe.mo.gov/ppc/ffsites.php. The website will be updated in case an event has to be rescheduled due to inclement weather. Because February is designated as Financial Aid Awareness Month, representatives from Webster University also will host additional financial aid events from 1 to 4 p.m. Feb. 6 and Feb. 20 on the home campus. To register, visit www.webster.edu/financialaid/fafsa-event.html. In addition to federal financial aid, Webster provides access to numerous university and private scholarships. More than 80 percent of all Webster University undergraduates receive some form of financial aid. Students attending a FAFSA Frenzy event can enter for a chance to win a scholarship for the 2016 fall term at a Missouri college, university or other postsecondary education institution. This is the 13th year Missouri has offered the FAFSA Frenzy program. Since 2004, FAFSA Frenzy events have provided assistance to more than 16,000 Missouri students. For more information about FAFSA, visit https://fafsa.ed.gov/. For more information about FAFSA Frenzy, visit http://dhe.mo.gov/ppc/fafsafrenzyforstudents.php.